Established in 2014, the Kathy Gehrt Memorial Economics Volunteer Service Award was named for alumna Kathy Gehrt (BA ’75, MA ’77), who passed away in April 2014 from complications related to a brain tumor and was the posthumous awardee of the inaugural 2014 award. The award seeks to recognize the efforts of a long-term department volunteer who has made a significant difference in the department through his or her involvement. Help us honor those who have given their time to support the people and programs of UW Economics by nominating someone for the 2019 Kathy Gehrt Memorial Economics Volunteer Service Award! Nominations are open to anyone and are anonymous. Deadline to nominate is April 30, 2019. The nominee should possess an outstanding commitment to the mission, programs, and people of the Department of Economics. This commitment may be demonstrated in a variety of ways, including service as an instructor, undergraduate or graduate mentor, alumni outreach, visiting committee member, regional representative, or other contributions of time, service, and philanthropy. All nominees will be notified of their nomination. The awardee will be selected by a committee of faculty and alumni and will be presented at the annual Visiting Committee Summer Social event. THANK YOU for taking the time to recognize our outstanding volunteers. Please send nominees name, along with a brief description of their volunteer involvement within the department, to Ellen Brown at browne5@uw.edu. 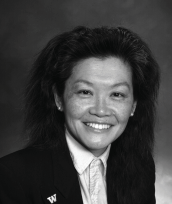 Olga Yang joined the Visiting Committee in 2005, and has been an active member since. She served as Chair of the Visiting Committee from 2008 to 2010, and is a member of the executive committee. She is now recognized as a Chair Emeritus of the Visiting Committee. Olga has been part of the mentorship program since its founding, and has helped lead the program for a good part of that time. Under her leadership, the program has grown from just a few student/alumni partnerships, to over 100 active participants. It was her idea to create the Zabriskie endowment, to ensure that the mentorship program would be supported in perpetuity. In addition to all this, Olga provides volunteer leadership to the Women in Economics group and supports an undergraduate scholarship in the department named for her parents, Yanlan and Robert Yang. She has supported the department financially for many years, including sponsoring match funds and hosting a variety of events. Her unwavering support and dedication has made her an integral asset to the department. Olga currently works as Commercial Underwriter for Philadelphia Insurance. Robert (Bob) Richards became a member of the Visiting Committee of the Department of Economics in 1990. He went on to serve as chairman from 2000-2002, and still serves on the Visiting Committee’s Executive Committee today.In addition to this support, Bob and his wife Marilyn have contributed to the Economics Department’s Distinguished Scholar program, providing financial support for research performed by Professor Shelly Lundberg and, subsequently, Professor Theo Eicher. Bob also currently serves as an advisor to the UW Economic Policy Research Center, as a lecturer in Economics 423, Financial Economics, as an instructor of Economics DL200 and DL201, Microeconomics and Macroeconomics, and as a mentor to recent graduates of the UW Department of Economics. Bob currently serves on the Investment Committee of Global Partnerships, which oversees the placement of funds from American investors and financial institutions into micro-finance institutions in Latin America. Bob received his BA in Economics from the University of Washington in 1961, and his MBA in Business Economics from the Graduate School of Business at Stanford University in 1964. In 1999, Bob was named the Economics Distinguished Alumnus by the University of Washington. As an economics alumni, Visiting Committee Chair, and continuing his membership and support of the Visiting Committee, Bob is one of those individuals who have the heart, the vision, and the energy to continually contribute to the Economics Department. Bob's contributions when the VC was in its relative early years are recognized today to be very important in the development of the VC. Bob's good advice to the committee and the department have formed the basis of something very solid and very good for the department. UW Economics alumnus J. David (Dave) Griswold has been an integral member of the department's Visiting Committee and alumni outreach efforts for many years. Dave joined the Visiting Committee in 1998 and was asked to become a member of the executive council in 2007. He served as Chair of the Visiting Committee from 2010 - 2015, the longest term of any committee Chairperson. During his time as Chair, Dave was instrumental in recruiting vibrant and engaged new members to the committee, bringing much-needed diversity to the group and helping to ensure the future financial success of the department by extension. Dave volunteered to be a part of the pilot program of the undergraduate mentorship program in 2011 and has been mentoring our undergraduate students since, additionally participating in various career seminars and workshops designed to assist students with their personal and professional development. As General Counsel and CCO of Pacific Current Group, David serves as the internal legal advisor on all major business dealings and transactions, and also oversees compliance and risk management for the firm. Prior to joining Pacific Current Group, David was General Counsel and CCO at Global Index Group, a start-up developing financial indexes for use in ETF’s and similar products. Prior to Global Index Group, David spent 19+ years at Russell Investments as the firm’s Associate General Counsel and Director of Global Regulatory policy. During his time at Russell, David represented a number of the firm’s business lines, including aspects of the firm’s 1940 Act mutual fund products, brokerage firms and Asia-Pacific offices. He graduated with a BA in Economics from the University of Washington and holds a JD from the University of Chicago. 2015 Awardees: Gabe Hanzeli (BA '76) and Walt Zabriskie (BA '71). Both Walt and Gabe are actively involved in a variety of department programs and initiatives, and their collective contributions have made a tremendous difference in the department over the years that they have been involved. 2014 Awardee: Kathy Gehrt (BA ’75, MA ’77) was an active volunteer and supporter of the department. In addition to serving on the Economics Visiting Committee from 1998-2014 – serving as the first female chair of the committee – Kathy was also an undergraduate mentor and spoke frequently at student career seminars. Kathy was honored by the department in 2004 as the Economics Distinguished Alumna, an award that recognizes an alumnus whose professional achievements have brought personal distinction. In recognition of her dedication to UW Economics, department leadership agreed that renaming the award the Kathy Gehrt Memorial Economics Volunteer Service Award following her death in 2014 was a fitting tribute to Kathy, providing a lasting reminder of her inspiring volunteerism and commitment to UW Economics.